In the Season 5 of the Pro Kabaddi League (PKL), the team of Patna Pirates beats Jaipur Pink Panthers in an inter-zonal match on Tuesday with a huge difference of 26 points in a one-sided match. In the match played at Netaji Subhash Chandra Bose Indoor Stadium, Patna beat Jaipur by 47-21. In the entire match, the Jaipur Pink Panthre's team was looking faint in front of Patna's Pirates finest and aggressive game. The game of Patna Pirates captain Pradeep Narwal, had a speechless game especially for Jaipur. He achieved success in 21 of which 22 raid cast. Patna Pirates started strong and kept Jaipur Pink Panthers under pressure. He started a good start from 4-1 and gave a wrinkle on the forehead of Jaipur Pink Panthers. He strengthened this edge with four consecutive points. Patna's team was ahead of 8-1 and Jaipur was threatening all out. 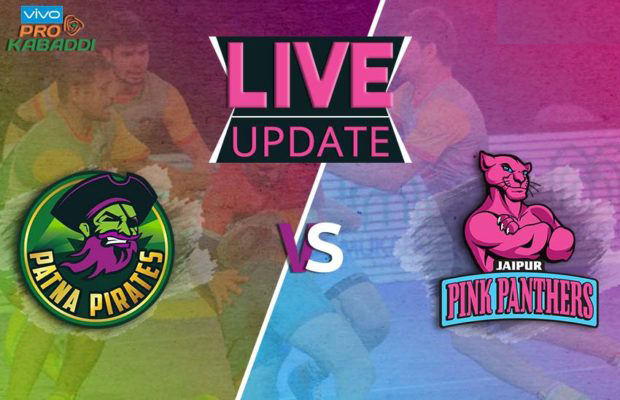 In the seventh minute, Patna Pirates outplayed Jaipur Pink Panthers to score 11-2. On the mat again, the team from Jaipur started taking some points from here, but could not match Patna Pirates till half time. Patna's team came out with a 19-9 lead in half time. Patna's captain Pradeep Narwal, who put nine raid points in his account till half time, completed his Super-10 as he came and added a score to the team's account. "Patna Pirates" retained its form in the second half and made it impossible to return for Jaipur Pink Panthers with eight consecutive points. The team of Jaipur Pink Panthers got screwed under pressure and after getting tired of taking points, They made a mistake on the mistake. The advantage of this was that Patna Pirates did not have to work much harder to collect the points. There was pressure on **Jaipur Pink Panthers** that they could not even reduce the difference in points and in the second half, they only collected 12 points. For them, eight points were best for Ajit Singh while Pawan Kumar got seven points.